Safe drinking water has always been one of the major concerns especially in rural India. 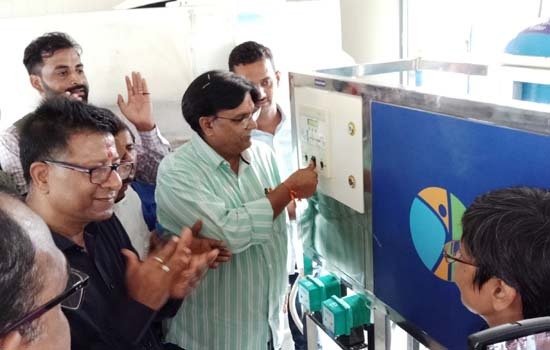 To address to this critical issue, Hindustan Zinc installs two water purifying RO plants in 2 Panchayats of Udaipur namely Maharaj Ki Khedi and Mandesar in Tus Dangiyan covering 4 villages. Each plant will function with a purification rate of 1000L/ hour, benefitting over 10,000 rural people of these villages. Mr. Sunil Duggal – CEO, Hindustan Zinc and Mr. Amitabh Gupta – CFO, Hindustan Zinc, also visited the plant. During his visit, Mr. Duggal, discussed about the operations of the plant and availability of drinking water in the village. In association with Water Life, these installed RO plants with a capacity of 3000 litres, are built with the advanced membrane technology with the help of which the water is processed via 10 stages of purification before being dispensed and are backed up by the solar power to prevent its dependency on electricity. 20 litres of water can be dispensed at minimum amount of Rs.5. Under this project, 4 water ATMs are also installed in the areas of Peepli Kuan and Garrivas in Maharaj Ki Kedi, and slums of Mandesar and Gomati in Tus Dangiyan. The water from these ATMs is available 24x7 and can be dispensed by the people with the help of a prepaid ATM card which were given to the villagers while registering them. Apart from these ATMs, an individual mobile ATM van with a capacity of 2000 litres was also inaugurated to reach out to the remote areas of the villages to which the plant is not accessible. The opening of the event took place in a Government School of Maharaj Ki Khedi. During the opening event, Mrs. Neelima Khetan – CSR Head, Hindustan Zinc, briefed about this initiative and the future course of action related to these plants. Mr. Pavan Kaushik – Head Corporate Communication said “People are benefiting from various projects run by the Hindustan Zinc and the company will always be committed towards the areas of education, health, cleanliness and empowerment”. Also present during the event were, Mr. Pravin Kumar Jain– Head Corporate Relations, Mr. Manoj Nashine – Unit Head Debari, Mr. Devilal Gurjar - Deputy Mininster, Mr. Nirmal Jain – Sarpanch, Mr. Mohan Ranbaore - Co-Founder of Water Life and other village members.